Hello and welcome to my place! I’m so glad you’re here. Since this a party, come on in and join us around the kitchen table. I’ll pretend I’m setting out the pine candles and lighting the Christmas tree. On the table there’s a plate of warm cookies and cups of steaming cider. Only I still have the autumn candles up and there’s no sign yet of a tree. Cookies may or may not happen. They definitely haven’t happened yet. Hey, it’s okay, though. For those of you who don’t know me, my name is Pam, and I’ve been a caregiver for over seventeen years. Things like holidays happen around our daily duties, doctor’s appointments, and physical therapy for our disabled son. I’ve learned a long time ago not to waste my tears over whether or not the Christmas cards get sent or if the cookies get baked. Life happens. And I’m doing the thing I was born to do…caring for someone who needs me. And that’s okay, even a joy, most of the time. But I never thought I’d be here, doing this, for the rest of my life. In the summer of 1997, we were a busy, growing family. Our son Kevin was nineteen years old and an aspiring musician. That July, while on a teen mission’s trip, he suffered a devastating spinal cord injury in a fall in Canada. He was immediately paralyzed from the neck down. Because he couldn’t breathe, he was kept alive by CPR until the emergency personnel arrived and took him to the hospital. He was flown to a larger hospital in Calgary, where we joined him after a twelve-hour drive through the night. Only one doctor gave us hope for his survival; recovery appeared impossible. While in Canada, we had to fight back a push for euthanasia, even though Kevin was conscious and fighting hard for life. Through a series of miracles–yes, miracles!–Kevin was flown back to the States in a privately chartered Lear jet. Here, he nearly died two more times before stabilizing enough to be moved to a rehabilitation hospital. In the ensuing weeks, he began to get back some feeling and function, even as he fought the complications of his injury. While he recuperated, we learned how to care for someone who was mostly paralyzed and on a ventilator. It was a big day for us when he finally came home. He had hoped to walk through the door. Instead he was wheeled in by the ambulance crew that transferred him from the hospital. We began our new lives in a new world for which we were little prepared. Kevin eventually weaned off the ventilator during his waking hours. He has regained enough back to walk with help, feed himself finger foods, and run a computer. He has built his own website devoted to Christian music, cmaddict.com . He lives each day in gratitude and with faith. I’m inspired by his courage. I’m awed at his ability to trust in a faithful creator. I’m honored to be his caregiver. So how do we celebrate Christmas? The best we can. One year, Christmas dinner was fish sticks and freezer fries. Most years it’s lots better. We, more than many, I think, understand what it is like to live from breath to breath. We know just how fragile life can be. We’re grateful to be alive and to be together. We may not always deck the halls with boughs of holly, but we celebrate the coming of the One who has delivered and sustained us through nearly two decades of disability. Christmas is the reminder that our Deliverer has come. We can have strength for today and hope for tomorrow. What better reason to celebrate? 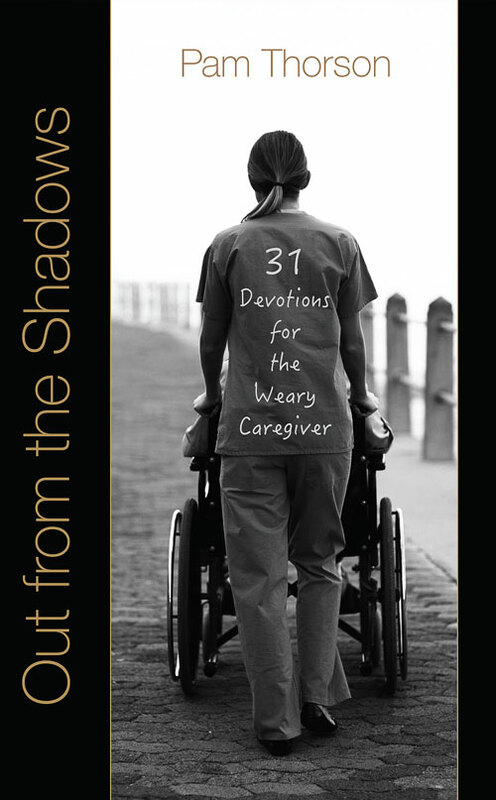 Enter the Giveaway and win a signed copy of my book, Out from the Shadows: 31 Devotions for the Weary Caregiver. Leave a comment on this post and you could win a signed copy of my newest book. This devotional has been endorsed by Joni Eareckson Tada, quadriplegic artist, author, disability advocate, and founder of Joni and Friends International Disability Center. Get the story of Kevin’s journey on Kindle. During the holiday season, Song in the Night, the true account of Kevin’s injury, is on Kindle for only 99 cents. Get it here. ← So You Want to Be a Writer: Now What? I admire your strength and perseverance as a mom and caregiver. I hold a lot of admiration and respect for Kevin’s fortitude and strong faith. It is something that encourages me as a caregiver and as someone who lives with chronic illness. Thank you for sharing your story and your son’s. You are making a difference! I wish you the very happy holiday season! Thanks for stopping by, Teresa. I’m inspired by your commitment to caregiving as you face the added challenges of a chronic illness. It’s important for us to encourage each other! May your holidays be bright and may your new year be one of joy. Hi, Pam and Family. “Merry Christmas” and all the chaos caused by the mundane world falls so far short when we look at the big picture. Thank you for sharing your story. It is helpful to flesh out new friends and fellow journeyers on the caregiving path. Thanks for being a Blog Post Host. I’m trying to cut down on my carbs and refined sugars, anyway, so don’t worry about the cookies. Hi, Jan! Thanks for stopping by. It is important to have each other on this journey. I’m so glad to meet you and hope you have a “Merry Christmas” too. May the new year be one of renewed hope and joy for you and those you love. Looking forward to reading more of your posts. I will add your blog to my website as I am sure my readers would enjoy reading your journey as well. Thanks so much, Trish. I’m looking forward to reading the other blogs. Your encouragement means a lot to me. May your holidays be merry and your new year filled with hope. So nice to meet you this holiday season through the Holiday Blog Party; my only regret is that it took me this long to visit/find your inspiring blog. The story you share is and the faith that you demonstrate inspires me, Thank You! We share the same belief, ‘It’s an honor to be a Caregiver’ I am now looking forward to visiting Kevin’s website, too! Wishing you and yours a very joyful holiday season! Thanks so much for stopping by, Chris. It’s nice to meet you, too. It’s been a long journey for us, and I’m glad we can inspire others with our story. May your holidays be filled with peace and your new year with joy.